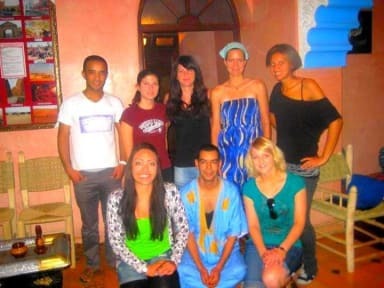 Before booking my hostel I researched in a lot of different apps and websites, the best that I found was Kif Kif Marrakech, worth every coin, near to the big square, friendly staff and excellent atmosphere, hardly recommended. 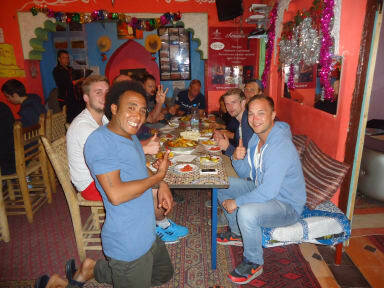 Amine and hauram and Mohammad friendly guys from the staff! Foi uma ótima experiência. Era um hostel bem animado durante a noite mas tranquila. Fomos muito bem recebidos, e tivemos uma noite de lasanha por conta do hostel. É bem simples, não possui lockers, chuveiro é bom, localização bem preta da praça principal, café da manhã simples mas gostoso. No geral o lugar é ótimo, bom custo beneficio! The hostel is well located, although the night and the maze that are the streets of Marrakech may get you confused to arrive there. The rooms are nice, but they don't have lockers. The staff is just amazing, really kind. I got sick during my stay and they were always asking me if they could help and they even made me soup! I'd totally recommend to have this kind of experience with such nice people! The hostel is well located, very close to the medina. The rooms are not clean though, no clean sheets. The whole space is dirty, bathrooms and kitchen. The staff is nice but a bit nosy. It was an interesting experience, we met nice people who were hosted there. You have to be careful with your stuff though. I left some things on my bed and they weren't there when I came back and in the morning there wasn't anyone there that I could ask about it. 10 for the ambience, 0 for the conditions.